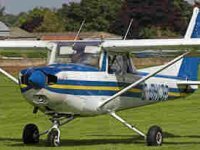 Product review: 70th Brthday – by Terry, 29 Sep 14 5/5 Excellent "It was easy, I phoned to arrange the day I wanted to take my flying lesson. No problem. The directions were clear and had no trouble finding the site. We used the club on site for a coffee, everyone was friendly. The toilets were clean, The staff were friendly and helpful. The meals in the club were very good.The briefing was helpful, I was very relaxed about my lesson. I found the experience thrilling, I can't wait for my next lesson.We took lots of photos because our friends were there with us as well. " Extra to your 30 minutes flight you will also receive a 10 minute briefing from your instructor which will outline the theory of flight and the basic operation of the aircraft, in preparation for your 30 minute experience in the sky. Should you wish to fly over a particular place of interest or your home mention this to your instructor and all possible requests will be granted. Make this a special day by sampling the freshly prepared cusine in the friendly atmosphere of our airfield clubhouse. With every Trial Flight Voucher you will be given 3 months free membership. The maximum weight is 17stone. It was easy, I phoned to arrange the day I wanted to take my flying lesson. No problem. The directions were clear and had no trouble finding the site. We used the club on site for a coffee, everyone was friendly. The toilets were clean, The staff were friendly and helpful. The meals in the club were very good.The briefing was helpful, I was very relaxed about my lesson. I found the experience thrilling, I can't wait for my next lesson.We took lots of photos because our friends were there with us as well.